Nose: Sweet and fruity on the nose with vanilla and ripe pears. Delicate wine aromas emerge, nicely mixed with beer flavours and hints of roasted oak and cinnamon in the back. Very aromatic and appealing nose! Palate: Sweet start on the palate with creamy vanilla, wine flavours and ripe pears. This is followed by an unexpected intense spiciness of oak, pepper, cinnamon and ginger. Very warm with lingering notes of roasted oak and espresso towards the finish. Finish: The finish is long and subtle warm. Becomes dry with oak, caramelized ginger and espresso. Tender sweet wine flavours nicely linger on the tail. With water: Fruity but less sweet on the nose with a few drops of water. The beer flavours are nicely present while the wine aroma is slightly pushed in the back. Sweet and fruity on the palate with vanilla, pears and wine flavours. The spiciness is significantly tamed with water, however, notes of roasted oak and caramelized ginger stille continue being present in the mouth. The finish is long, subtle warm and less dry with reduced roasted oak flavours. Lovely creamy vanilla and ripe pears on the tail. Comments: I was quite surprised and very pleased by this lovely sweet and fruity single malt from Switzerland. The maturation in beer and subsequent wine casks works pretty well here bringing delicate flavours of pears and wine to the fore. This is well-balanced by the surprisingly bold spiciness of the oak. 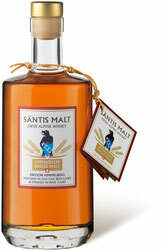 A flavourful and savoury Swiss malt. Light and fruity, spiced and woody!